The Ultimate Metabolism Diet: Eat Right for Your Metabolic Type is the creation of weight loss specialist Dr. Scott Rigden. Rigden believes that people can be categorized into five different metabolic types, each of which requires a specific dietary and lifestyle pattern in order to achieve and maintain their ideal weight. Dr. Rigden guides readers through the process of determining their metabolic type. A chapter in the book is devoted to each type and provides specific advice regarding diet, exercise, nutritional supplements, and medical information that will enable you to maximize weight loss in accordance with your unique needs. Rigden outlines the five different metabolic disorders that can interfere with the ability to lose weight. Each metabolic type includes examples of actual case histories that will assist in your ability to determine which category you fit into. Rigden also addresses the issue of emotional eating and gives advice on how to mentally prepare for weight loss. He discusses the five “P’s” of successful weight management, which include patience, persistence, planning, positive thinking, and perspiration. Raw and lightly cooked low starch vegetables, low glycemic fruits, nonfat cottage cheese, nonfat plain yogurt, lean meat and poultry, raw nuts, olive oil, legumes, whole grain bread, protein shakes, avocado, salmon, eggs, Ryvita crackers, brown rice, sweet potato. This is an example of the diet plan for Metabolic Syndrome. Specific exercise recommendations vary depending on which metabolic type the dieter is categorized as. All dieters are advised to engage in daily walking to promote weight loss and improved health. 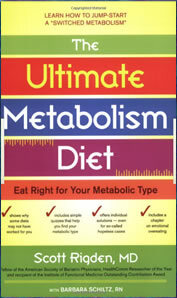 The Ultimate Metabolism Diet: Eat Right for Your Metabolic Type retails at $15.95. Speaks to those who have had limited success with conventional approaches to weight loss. Provides information specifically related to heart disease, diabetes, thyroid disorders, adrenal fatigue, polycystic ovary syndrome and food allergy. Takes into account individual variations that may impact on the ability to lose weight. Discusses how some prescription medications can result in weight gain and how to solve this problem. Quite restrictive, eliminates a wide variety of foods and may be difficult to eat out. May require the use of supplements and medical food replacement powders, which could be expensive. Includes a lot of medical terminology, which may overwhelm some readers. The Ultimate Metabolism will appeal most to dieters who have attempted to lose weight by following a more healthy lifestyle yet have failed to achieve their desired results. It provides a more individualized approach that is likely to assist dieters when their ability to lose weight is complicated by other health issues.